Peter Blaxell, Dr. John Baron-Hay, Barry Honey and Colin Cowden. The Board of Directors are responsible for the day-to-day management of the Foundation, including fundraising, investing, marketing, and communication, assessing and awarding the annual grants and awards. Directors are appointed for a three-year term and can serve a maximum of three terms (nine years). Philippa Packer, Doug Kerr, Paul Green, Greg Moore, Tony Finch and Cliff Lawrence. As the RTYF continues to evolve and strives to achieve its mission, the Directors hope to raise the profile sufficiently so the whole yachting fraternity can recognise and realise the benefits of the philanthropic objective the original founders wanted. The Foundation has also recently adopted an ambitious new goal of being able to award annual grants totalling $150,000 per year by 2022 to deserving candidates. To do this, we need your assistance. For those sailors (of all ages) who have either benefitted from a grant or believe in what the Ron Tough Yachting Foundation is trying to accomplish, we would be very grateful for your support. Help us to help them by donating now. 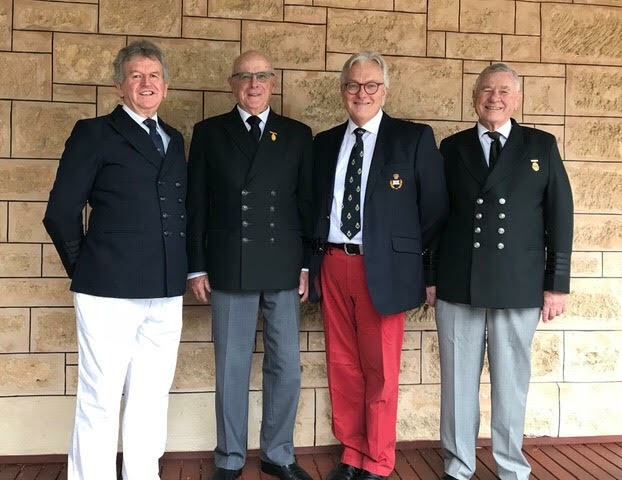 Tony has been a member at Royal Perth Yacht Club for over 30 years, and regularly races his Endeavour 24 yacht, which he has had for the same period of time. Tony is a past President of Yachting WA, was previously a member of the management committee of RPYC, and has been a long standing committeeman of the Endeavour 24 Association. Tony is a qualified Chartered Accountant, who works with small to medium sized businesses as Financial Controller. Cliff Lawrence, a retired businessman, sails on his Foundation 36 yacht competitively from the South of Perth Yacht Club where he has been a member for the past 34 years, holding various committee positions including Selector on the YWA Awards Selection Panel. Cliff has served as a previous Chairman of the Ron Tough Yachting Foundation and has been a Trustee of the Foundation for more than 20 years. Doug Kerr is the Chairman and Managing Director of the Shacks Motor Group, Holden Dealer in Fremantle and Holden & Mazda Dealers in Rockingham, Western Australia. Doug is a Fellow of the Australian Society of Practicing Accountants and in 2011, was inducted into the Fremantle Business Hall of Fame for past services to the Fremantle business community plus awarded “Life Membership” of the Fremantle Chamber of Commerce in 2006 and in 2015 awarded ‘Life Membership” of the Motor Trade Association. He is a member of RFBYC, RPYC and EFYC, an active Etchells sailor, a past President of Yachting Western Australia and a past Director of Australian Sailing. Philippa started sailing at the age of eight in the UK and has continued ever since. She joined RFBYC immediately on arrival in Australia in 1987. She is a keen and active Flying Fifteen sailor at Club, State, National and World Championship level as well as making cameo appearances in other fleets. Greg Moore is a dinghy sailor who has competed in National and South Pacific Championships in various classes including Herons, (with family members), LW Sharpies and Javelins. He is a part owner of a Beneteau Oceanis cruiser penned at Royal Perth Yacht Club. He is also a past Commodore and a Life Member of both Perth Dinghy Sailing Club and Maylands Yacht Club. Paul first learnt to sail at Fremantle Sailing Club when he was 10. In the 38 years since he has been a regular competitor in boats including Cherubs, Lasers, Flying Fifteens, Herons, Contenders, I14, Sharpies, and currently a Musto Skiff. Paul has degrees in Accounting and Business Law and has worked in tax accounting, marine tourism, retail merchandising and the building industry. Within sailing Paul has held positions including Commodore of Shelley Sailing Club, Dinghy Captain and regular Race Officer at Fremantle Sailing Club, International Measurer for the Laser Class, State Measurer for the Optimist Class, State Umpire for Match and Teams racing, Sailing Instructor, Club Coach, and National Juror, along with many YWA and association committee positions.